Born on the north coast of Alaska in 1904, Patsy Klengenberg was the oldest son of Christian Klengenberg, a Danish sailor, and Gremnia, an Alaskan Eskimo. In 1910 the Klengenbergs moved east along the Arctic coast to Darnley Bay, northwest of the present day community of Paulatuk (map). 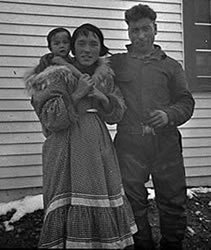 It was there the family lived a traditional Inuit life style and where, in 1915, Patsy was given a rather unusual opportunity at a formal education. In the spring of that year scientists from the Canadian Arctic Expedition set up a base at Darnley Bay and Patsy was hired as a guide and interpreter. In return he was taught how to read and write, how to do math, a little geology and natural history, but most importantly, modern techniques for treating and preserving furs. Combining this knowledge with his Inuit traditional knowledge helped the Klengenberg family prosper as trappers and Patsy and his father began to transport furs to Seattle where goods were purchased and brought back to the Arctic for trade to Inuvialuit and Inuit trappers. This became a very profitable business that Patsy inherited when his father retired to Vancouver. Patsy Klengenberg, an astute business man, expanded the network of trading posts and by the 1930s was trading with trappers on the Arctic coast as far west as Barrow, Alaska and east to Gjoa Haven, Nunavut. Patsy owned a schooner called Aklavik, a familiar sight in the waters of the western and central Arctic in the 1930s and 40s. During the early morning hours of August 31, 1946 tragedy struck. The Hudson's Bay Company had chartered the Aklavik to take emergency supplies to their trading post on King William Island. Patsy sailed the Aklavik into Cambridge Bay, anchored a short distance off shore and began to take on supplies. The plan was to leave very early the next morning for the King William Island post and according to witnesses it was just before the scheduled departure that Patsy was in the engine room when fire broke out. Patsy ran and woke the crew, which included Donald Ayalik, Patsy's fourteen-year-old foster son. With the crew up on deck Patsy ordered them ashore then returned below to fight the fire. Donald refused to leave, choosing instead to help Patsy who had disappeared into the smoke and flames below deck. Donald tried, but failed, to enter the engine room where he thought Patsy was trapped and Donald only barely managed to make it back on to deck before the ship exploded. Donald had to be rescued from the frigid waters of Cambridge Bay. It was thirteen days later that Patsy’s body washed ashore.